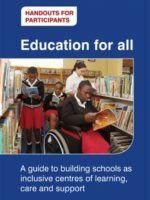 MIET AFRICA partnered with Africa Disability Alliance (ADA) and The Southern Africa Association of Learners with Education Differences (SAALED) on the Promoting Inclusive Education for Leaners with Disabilities in Southern Africa project. The project was aimed at (i) finalizing the SADC Inclusive Education Strategy, (ii) developing a system and tools for collecting data on learners with disabilities, (iii) developing a teacher training programme on inclusive education for the Southern Africa region. ADA was responsible for getting the finalized strategy adopted by the SADC Ministers of Education, MIET AFRICA led the development of a data collection system and tools, while SAALED developed the teacher training programme. The project was implemented in Botswana, Namibia, South Africa, Swaziland and Zambia.